One of the missing links in our understanding of the Triassic Period – between 252 and 201m years ago – is why there were so few dinosaurs in the tropics. Our research suggests that volatile, hot dry weather and high carbon dioxide levels are to blame. The research can even tell us something about the challenges we humans face from climate change. The first dinosaurs emerged just over 230m years ago, during the Late Triassic Period. This was one of the most dynamic intervals in the Earth’s history, with large-scale climatic changes. The planet was also coping with the recovery from one mass extinction and the onset of another. At the same time, many of the animal groups that dominate today’s terrestrial ecosystems – including frogs, salamanders, turtles, lizards, and mammals – were emerging. One of the major unresolved questions of dinosaurs’ rise to dominance is why large-bodied herbivorous dinosaurs were missing from the tropics, despite the fact that they lived in higher latitudes. Small, carnivorous dinosaurs, however, populated the entire planet – including in the tropics. 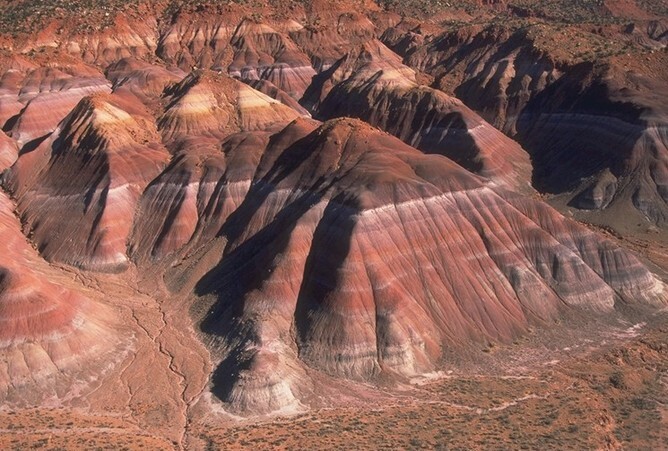 To tackle the issue, our international team investigated sedimentary rocks from a number of places around the Upper Triassic Chinle Formation in New Mexico, including the fabled “Ghost Ranch”, whose multicoloured cliffs inspired artist Georgia O’Keeffe’s landscapes. However, they also preserved North America’s most extensive fossil evidence of the rise of dinosaurs and their competitors. At the time that these sediments were deposited by rivers and streams, the areas were very close to the equator at about 12°N latitude (northern New Mexico is at 36°N today). This is the same as the current latitude of the southernmost tip of India. By excavating unweathered rock in the field and then crushing samples in the lab we could separate the isotopes of carbon from fossilised organic matter in rocks using mass spectrometry. 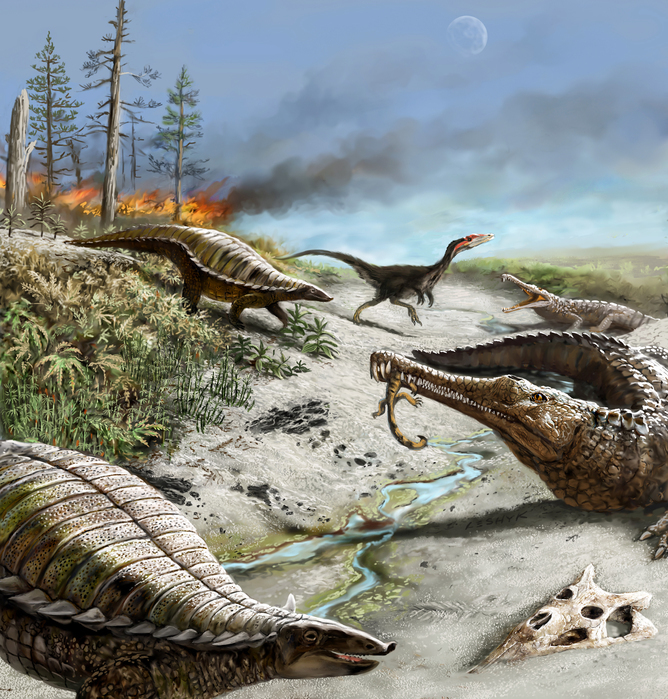 The isotopic ratios suggest that major rapid changes in ecosystem productivity and atmospheric CO2 levels took place during the Triassic Period. These rocks also preserve abundant fossil charcoal. Based on the amount of light reflected from fossil charcoal under a microscope, we could see that wildfires must have swept the landscape at the time. These would have continually changed the vegetation available for large plant-eating dinosaurs. By extracting fossil pollen and spores from the sediments and by excavating and identifying vertebrate body fossils, we could also identify the plants and animals living in the area. Our data show that plant groups varied in abundance in connection with climate swings, and that the only dinosaurs present were rare, meat-eating theropods. As such, we conclude that large plant-eating dinosaurs were absent because there were not enough predictable food and water resources for them to thrive. Our study suggests that the climatic effects of elevated CO2, which were four to six times that of modern levels, drastically reshaped the environment and had profound consequences on the composition of ecosystems on land. The discovery is not only important for understanding our past. Rapid climate swings and extremes of drought and intense heat driven by increasing atmospheric CO2 levels have as much ability to alter the vegetation supporting modern human populations as they did for the large plant-eating dinosaurs in the Triassic. These data therefore suggest there are potentially profound challenges to human sustainability in the future if we experience the high CO2 conditions predicted to develop in the coming 100-200 years. Jessica H. Whiteside is Lecturer in Ocean and Earth Science at University of Southampton.